When looking at the well documented history of the companies of Carl Magnus Hutschenreuther from Hohenberg (Bavaria) and his son Lorenz Hutschenreuther from Selb (Bavaria), it makes one wonder that so many people still do not know that these were independent companies, each with their own product lines and designs until the company of Lorenz Hutschenreuther took over the Hohenberg factory in 1969. On the other hand it is therefore not surprising that most people simply overlook the third member of the Hutschenreuther clan simply because he operated outside Bavaria. Hermann Hutschenreuther was a cousin of Carl Magnus and his factory (seen in comparison with the other two) was fairly small and less successfull, but still made stunning items that could easily stand up against the larger companies in regards of design and quality. Businessman Hermann Hutschenreuther first appears as silent partner in the company of the ⇒Porzellanfabrik Unger, Schneider & Cie., which was located in Gräfenthal (Thuringia) and existed from 1859 until 1885. When Carl Schneider died in 1885, his shares were inherited by his only son who also took over the shares from Unger at the same time. During his previous work in the company, young Schneider had greatly impressed Hermann Hutschenreuther who now gave up his silent partnership openly supported Schneider, based on an agreement that the company of Schneider & Hutschenreuther should exist until both decided that the business was stable enough for Schneider to continue on his own. It speaks for the talent and energy of young Schneider that this partnership only existed for a year and during this time Hermann Hutschenreuther opened his own factory in Probstzella which saw the first firing in November 1886. The newly founded business at first made normal tableware, but soon specialized on porcelain gifts, doll heads and religious items and as both companies made figurines there was a constant transfer of knowledge between the Hutschenreuther factory and that of young Schneider; the similarity in design and decoration is sometimes quite obvious. This technology transfer was continued until Hutschenreuther died shortly before the turn of the century, leaving the business in the hands of a few directors who turned away from the too figure-based product range and concentrated more on international demand. 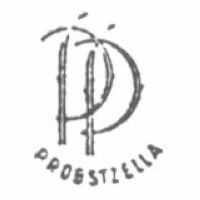 In 1913 the Probstzella factory already exported to many other countries and employed 165 workers; this number remained constant from then onwards and even the WWI period barely affected business. The following years until WWII saw the area of Thuringia advance to one of the largest porcelain producing areas in Germany next to Bavaria and especially the Gräfenthal area became famous for its porcelain figures. Like all East German states, Thuringia was greatly affected by WWII and when it finally ended, the whole are was part of the Soviet Occupation Zone until 1949 after which it belonged to the German Democratic Republic. In 1952 the company was nationalized by the East German government and renamed to ⇒V.E.B. Porzellanfabrik Probstzella, but remained an independent factory and kept its own product line until it was merged into the V.E.B. Vereinigte Porzellanwerke Könitz combine in 1964. Under supervision by the larger V.E.B., the Probstzella factory was converted and refitted to mass produce hotelware and simple mugs. From then on it's only objective was to increase output capacity of the Könitz main plant and like so many East German industrial complexes the factory was not upgraded or modernized in any way. This finally resulted in the closure of the totally run-down factory in 1978. When checking marks from the Probstzella factory there are various things that should be looked out for, for example the earlier Hutschenreuther G.m.b.H. 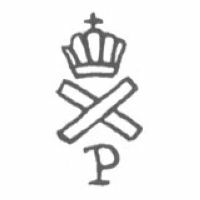 marks can be tricky: while the first mark with the 'P' over the 'H' was in use from 1886 onwards and registered relatively late, the better known 'X' mark is harder to date as the mark itself was not registered even if it safe to say it was used from around 1889 onwards as impressed version. This mark has to be seen independently from the use of the 'DEP.' additions which only state the design of the item was registered at the district court; this local registration type was discontinued in 1891 when it was replaced by the centralized registration procedure under the laws applying for 'Deutsches Reichsgebrauchsmuster' which resulted in 'D.R.G.M.' marked items. The tricky part is that the 'DEP.' 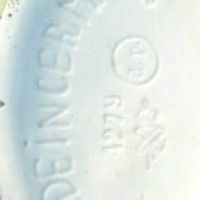 marking is found on some items that had been registered and were still produced unchanged up until 1896 as the local registration could be extended. So somebody registering under old law in 1891 could still claim his items were 'DEP.' registered until 1896. Therefore Hutschenreuther G.m.b.H. items carrying the 'X' and 'DEP.' 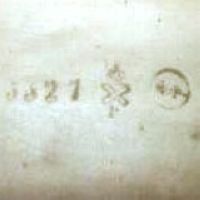 marks could normally be dated between 1889 and 1896. However recent information indicates that both Hutschenreuther himself and the later V.E.B. 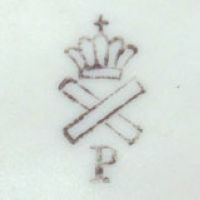 Probstzella re-issued older items including the original marks; this was stopped in 1954 after the V.E.B. finally adapted the 'PP' mark for all items. This means that the marking alone can not be used for dating, the overall state of the item should be seen in context. 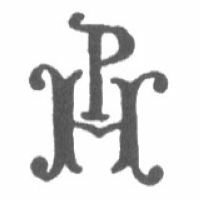 'PH' used from 1886 onwards, registered at the Herogliches Amtsgericht Gräfenthal under №·4 on June 12th 1889. 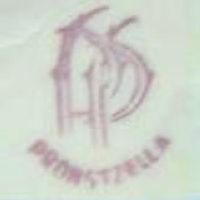 Basic form of the best known Probstzella mark. 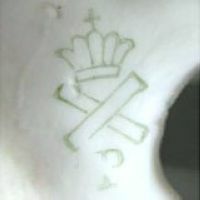 More often the mark can be found impressed, note the pre-1891 'DEP.' marking and (here truncated) 'MADE IN GERMANY'. Another example, here the circular 'DEP.' marking (used before 1891) is nearly unreadable. Used until 1952, here an example of the printed version in green. Used until 1952, another example of the printed version. 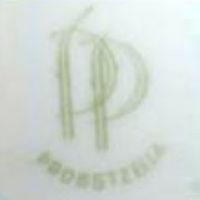 'PP' for 'Porzellanfabrik Probstzella' over 'PROBSTZELLA'. Same as before, here an example in green. Same as before, here an example in red.